Drasha given in Kinor David on Shabbat VaYakhel-Pekudei / Parah, 23 Adar 5778. Today is the Yahrtzeit of my father, Peter Rozenberg, Pinchas ben Natan Nota, z”l; who was a member of Kinor David for ten years. It’s been five years since his passing. This Drasha is in his memory. Moshe gathers the Jewish People to tell them about the commandment to build the Mishkan, to fulfill the ambition of “I shall dwell among you” – G-d’s Presence within the Jewish People, serving G-d through sacrifices, the Holy of Holies. Before the building of the Mishkan could begin, they had to be told to keep Shabbat. So, first of all, on a practical level, this is how we learn what is considered “work” for the purposes of the Laws of Shabbat: anything that is necessary for the building of the Mishkan is forbidden on Shabbat. That is the source of the 39 Melachot of Shabbat. But taking a step back, there is a bigger picture. The two commandments are two related ways to serve G-d, two forms of sacrifice: keeping Shabbat, and the sacrificial service of the Mishkan. In our Siddur, there are phrases that we add on Shabbat. They begin with the word “Retzei” (accept). We say, “Retzei ve’Hachlitzenu”, “Retzei be’Menuchateinu”. This term is normally used in the context of serving G-d through sacrifices (and the prayers that substitute for them). For instance, the blessing in the Amida, “Retzei”, is labeled by the Koren Siddur as “Avodah” (Service). It says, “Accept the Jewish People and their prayers and bring back the Service …. May their Service be accepted by You”. “Retzei”, “accept”, refers to the Service of G-d, Avodah. What, then, is “Retzei be’Menuchateinu”, “accept our rest”? Our rest is, in itself, our Avodah, our Service. Shabbat, too, is sacrifice. I read an article recently, about the sociology of Modern Orthodox people, in particular, of women, which suggested that we have three shifts. Work is one shift, family is the second. The third shift is Shabbat. It’s not one day of seven, it’s an entire “shift”. When I read that, I thought, yes, well, till I finish clearing up after Shabbat, it’s around … Tuesday… and by then I’m already inviting guests for the next Shabbat. So yes, it’s a whole shift. But that same article pointed out how that third shift, Shabbat, gives balance to the other two, and meaning to the rest of our lives. It is an opportunity to be with the family, with ourselves, to get dressed up, to enjoy good food, to see friends, to come to shul, to sing and to pray. It is not a punishment, it is a gift. There is another phrase that we add to our prayers for Shabbat – in fact, we will do so this Pesach, which is approaching all too soon. In the Kiddush of the Seder, we will add “Be’Ahava”. And during the Amida, we will add “BeAhava u’ve’Ratzon”. Not just Ratzon, but also Ahava. Because Shabbat is a gift of love from the Ribono shel Olam, His love for us, and our love for Him. My father, as you might know, did not grow up with Shabbat. It was not possible to observe Shabbat in the Soviet Union, to say the least. So when we came to America and were reunited with a Torah observant Jewish community, it was very difficult for him to understand Shabbat. Why are some things considered Melacha, and forbidden, and other things, which require more effort, are permitted? We were invited for many Shabbat meals by families in our community in Far Rockaway, week after week for years at a time, but it was Shabbat from the outside. Then we all went to Israel for a 3 week trip, and there, my father experienced Shabbat from the inside, the whole thing. When we got back, he said, “I understand that He wants me to go to Shul on Shabbos.” So he did. And clearly, when one comes home from Shul, one makes Kiddush, and if one makes Kiddush, one has to have a bite of something, yes? And so it was. He had Shabbat, with friends in shul, with singing, and davening, with an ironed shirt, and brandy for Kiddush. Be’Ahava u’ve’Ratzon. And on his last Shabbat, he came to Kinor David, in a Shabbat shirt, to be with us all, and enjoy Shabbat, be’Ahava u’ve’Ratzon. This young man was Gidon, who went on lead the Jewish People to a decisive victory over Midian, and entirely eliminated them as a threat. The same term appears when describing the actions of other leaders, and in particular, the kings Shaul and David, who were appointed to bring yeshuah by defeating Israel’s enemies. However, the first time that the enemies of the Jewish People were soundly defeated, the yeshuah did not come from a human king or leader. The term first appears at the Splitting of the Sea, which is the Torah reading for the last day of Pesach, the anniversary of that event. My strength and my song is G-d, He became my deliverance… Hashem is a man of war, Hashem is His Name … Hashem will be the king for all eternity! By effecting this yeshuah, G-d showed us not only that He is all-powerful, but that He is specifically our King, and that He uses His power to defeat our enemies. But if G-d is our king, why did He need to appoint mortal leaders to bring about yeshuah? It seems that it is not ideal for G-d to directly intervene and miraculously get rid of our enemies. Part of the function of the Jewish People as the Nation of G-d is that we have a partnership with Him. He doesn’t fight our battles for us while we stand around helplessly wringing our hands, He expects us to defend ourselves. At the same time, we must realize that we will not succeed without His assistance, and it is vital that we continue to see Him as our King, and the source of our yeshuah. It needs to be clear to us that we will only defeat our enemies if Hashem, Ish Milchama, is with us. Gidon took these three hundred men and used them to wreak mayhem on the Midianite war camp, who turned on each other in their confusion. As a result, the victory of the very few over the very many was credited to G-d.
None of David’s victories were miraculous; no seas were split. It would have been natural for him to credit his own courage, his military prowess, and the dedication and training of his staff. Instead, he attributed all of his victories to G-d.
And so, even as we wait for the descendants of David HaMelech to do their part in defeating our enemies, the yeshuah that we hope and wait for, is from Hashem, our King. The Sin of the Golden Calf made it clear that despite all the miracles of the Exodus, of the Splitting of the Sea, and of the Revelation at Sinai, the Jewish People really did not understand G-d. They were too bound up in the pagan mindset of Egyptian culture, where every god had his own set of characteristics. This expression, Rav Chessed ve’Emmet, which is usually translated as “great kindness and truth,” is actually quite hard to interpret. Rashi says that “Chessed” is when one is given more than one deserves, and “Emmet” is when one is given precisely what one deserves. He sees the two words as antonyms – Chessed vs Emmet. Moreover, what does it mean to have “great truth”? Truth is binary; something is either true, or not. But here we have “Rav Emmet,” a lot of truth. So there’s such a thing as only some truth, and a lot of truth? And sometimes, we can also have all the truth? It is very clear that the two parts of the verse are parallel; the words “Chessed” and “Brit” are synonyms, not antonyms. “Chessed” here is the fulfillment of promises. The three words, “Chessed,” “Emmet,” and “Brit” are variations on the same theme – the idea of keeping one’s word. I’m not saying that “Chessed” isn’t kindness; the actions that result from it are indeed kind. However, Chessed does not come from feelings of compassion or benevolence; it comes from commitment. To help us understand the distinction between plain “Chessed,” and “Rav Chessed,” I will tell you a story about my father, z”l. When my sister and I were growing up in America, we were a small family. Just parents and two children (although two children is already a big family for Russians 😉 ). With the exception of some very dear friends who were distantly related to us, all of our extended family was behind the Iron Curtain, and we were able to be in touch, with great difficulty, with only a handful of them. Then our parents came to live in Israel, and it turned out that we had a whole bunch of second and third cousins, many times removed, who lived here. One of them was Aunt Donya, my father’s mother’s youngest first cousin, who was at the time in her early eighties, living in Ashdod. Needless to say, my father made an effort to make contact and visit her. That is “Chessed,” devotion – remembering connections and commitments, and strengthening them, despite the passage of time. But my father did not stop there. He called Aunt Donya every single week, every Tuesday, for ten years. In fact, she was one of the first people to find out that he had passed away, because it was Tuesday, and he hadn’t called. That is “Rav Chessed” – great devotion; unfailing commitment. We look around us, and we see that these words have been fulfilled. How lucky are we, our generation, to be able to say that? So now we know that “Rav Chessed ve’Emmet” means that G-d keeps His word despite the passage of time, with great commitment and devotion. This is important because in the pagan mindset, this is not at all obvious. In the pantheons of many cultures around the world, there is a god who is described as a “trickster” – Loki – a god whose main characteristic is his unpredictability; not only can he not be trusted, he goes out of his way to wreak havoc. There is something in the human psyche that makes us want a god like that, perhaps to explain the chaos in the world around us. This has even affected Jewish culture: there is an expression in Yiddish: “Der mensch trakht un gott lacht,” “man plans and G-d laughs.” But for us, it is not coming from the same place. It is not that we think that G-d enjoys it when our plans go awry, and that He’s doing it out of some perverse pleasure in our pain. It is that we realize that His plans are greater than ours, and that we are limited human beings who can only do so much. But Hashem, our G-d, He is Rav Chessed ve’Emmet – He speaks and He fulfills His word. G-d words of Emmet would have been fulfilled if Yerushalayim had been rebuilt within its original boundaries. But that is not what we see. We see hill after hill covered in buildings, miles of them. Hundreds of thousands of people. His words of Emmet would have been fulfilled if the land were simply supporting its population. But we export cut flowers to Holland, and tropical fruit to Italy. G-d had promised him that He would take care of him. And He did, through very trying times. That promise would have been fulfilled if he had just gotten back safely. When Yaakov looks around at what he was given, he is overwhelmed by the quantity of Emmet, of fulfillment. We also look around, and we are also overwhelmed by the quantity of Emmet. Because that is our G-d, Hashem, Who says and then does, Who speaks and then fulfils. G-d Whose characteristics are Rav Chessed ve’Emmet. Unfailing devotion, and eternal, overwhelming commitment. Miketz is read rarely, as it is almost always either Shabbat Chanukah, either the first or the second. The Haftarah of Miketz begins by describing his waking up from this experience and realizing that it is a dream. This is followed immediately by a story that demonstrates the wisdom and perceptiveness that he had been granted, the famous “Mishpat Shlomo” (Solomon’s Judgment). Two women, prostitutes sharing a home, come to the king for justice. The plaintiff claims that the defendant’s baby died in the night, and she switched the babies, claiming the live one as her own. The defendant denies it. 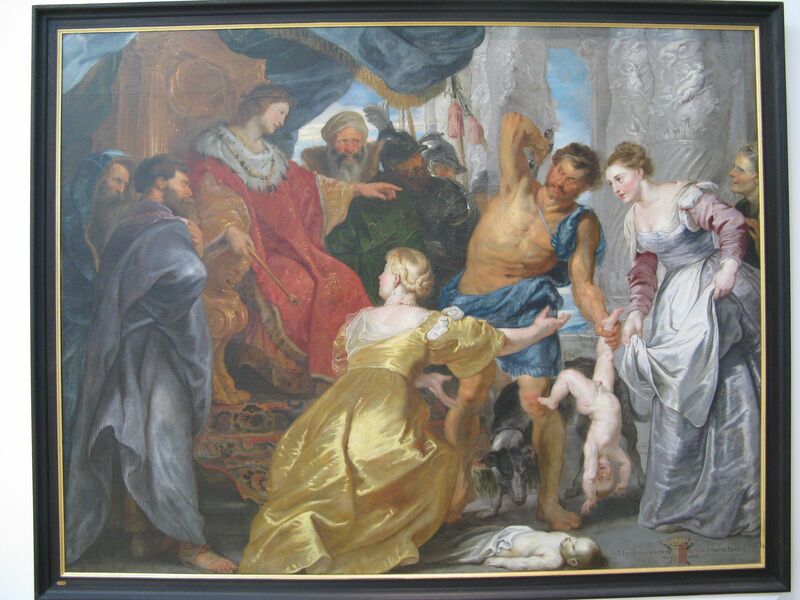 Shlomo commands to bring a sword and cleave the baby in half. 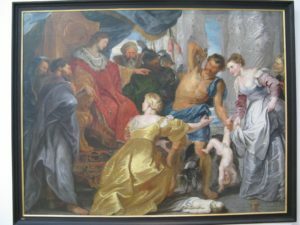 One of the women pleads to spare the child, and the other says, “Neither one of us will have it!” Shlomo declares the true mother of the child to be the one who was willing to give the baby up to save his life, and “the Judgment of Solomon” becomes a by-word forever after. We are so familiar with this story that it is hard for us to imagine not knowing how it ends. But let us put ourselves for a moment in the court of the inexperienced young king. Imagine the reaction of the onlookers when he said, “Bring me a sword.” Imagine the shock when he said, in all seriousness, “Cut the child, and give half to one and half to the other,” as if it were a monetary dispute that can be resolved that way. They did not think that he was bluffing. They thought he was going to murder the child and claim that it was justice. It was the stress of this shock that caused the women to drop their defenses and reveal their true feelings. Shlomo intentionally set up the circumstances for that shock and manipulated them into dropping their guard. This showcased the “wise and perceptive heart” that G-d had promised him in his dream. The dream leads Pharaoh to appoint Yosef to be the “wise and perceptive man” overseeing all of Egypt. Surprisingly, the Parsha spends very few verses showing how Yosef, in his wisdom, overhauls the economy of Egypt and saves its population from starvation. In contrast, it spends entire chapters describing how Yosef manipulates his brothers, causing them stress and shock. From accusing them of beings spies, to jailing Shimon, from demanding that they return with Binyamin, to replacing their money in their bags, from seating them in age order, to accusing Binyamin of having stolen the goblet, it looks like Yosef is toying with them, and it is not clear why. One of the solutions offered by the commentaries is that Yosef felt it necessary to make his original dream, the one with all his brothers bowing down to him, come to pass, which could only happen if all eleven of his brothers did so, including Binyamin. Other commentaries question this idea. Even if there is value in making dreams come true, could that justify what appears to be cruelty on Yosef’s part? This where the “wisdom and perception” comes in. Like Shlomo, Yosef created situations where his brothers’ defenses came down, and their true feelings were revealed. Did Yosef know, when he first saw them, that they had this in them? Most likely, they themselves did not know. Until it was expressed, through words and actions, their sense of family unity and mutual responsibility had been uncertain. Yosef manipulated them, shocked and stressed them, so that what they revealed would be their innermost truth. It was not easy for any of them, and caused much grief and many tears, but ultimately, they bowed down to Yosef, fulfilling the dream of his youth, without rancor and with hope for reconciliation. The Parsha of Tazria spends the bulk of its text on the diagnosis of the Biblical disease, Tzaraat, “leprosy.” In his summation of the Laws of the Impurity of Leprosy (16:10), the Rambam points out that the term “Tzaraat” covers so many unrelated symptoms that it cannot possibly refer to a natural malady, but is rather a supernatural phenomenon whose purpose was to cause people to reevaluate their behavior. The particular behavior that the Rambam singles out as the cause of Tzaraat is Lashon Hara, speaking in a derogatory manner about other people. A person who makes a habit of doing so will first see signs of Tzaraat on the walls of his house. If he stops his behavior, the house can be purified; if not, the house will need to be destroyed and it will affect the furniture, then the clothes, and ultimately his own skin, and he will be isolated so that he is unable to speak with anyone about anything. The purpose of all this is to shock a person into changing his behavior and the dismissive attitude that underlies it. Whereas the Rambam focuses on Lashon Hara as the behavior that Tzaraat is meant to reverse, the Midrash lists several other behaviors and character traits that cause it. One of them is the subject of the Haftorah of Tazria. Na’aman, the general of the king of Aram, was a great man at court, and highly esteemed, for through him, Hashem had given victory to Aram. The man was a great warrior, a leper. Na’aman got angry and stormed off. He said, “I had said to myself, he’s going to come out, and stand, and call in the name of Hashem his God, wave his hand over the place and the leprosy would go away. Aren’t Amana and Pharpor, the rivers of Damascus, better than all the waters of Yisrael? Can’t I bathe in them and be pure?” He turned and walked off in fury. Na’aman feels that he knows what the treatment for his leprosy should be like, and what will and will not work. As a “great and highly esteemed” personage, he is sure that he knows everything there is to know, and deserves every attention and consideration, and if someone who is so clearly beneath him violates his expectations, he loses his temper and storms off. Na’aman, who was introduced as a “great man at court, highly respected,” who sneered at the suggestion that the Jordan River would effect a cure when the rivers of his own country would not, ends up begging for some dirt from Eretz Yisrael. The Haftorah shows us that Tzaraat is meant to serve as a catalyst for change. If someone as proud and prejudiced as Na’aman had been can learn to see past his ego, then so can we. When we look down at other people, or seek to raise ourselves in the eyes of our friends by taking down those around us, we are guilty of haughtiness as Na’aman had been. We might not even be aware that we are being led astray by our egos. Tzaraat is a supernatural wake-up call to examine ourselves, to alter our behavior and revise our attitude before things get even worse. Tzaraat is reversible, and so are our character flaws. When Rosh Chodesh comes out on Sunday, then, on the previous Shabbat, instead of reading the Haftarah that is appropriate to that Parsha, we read a special Haftarah called “Machar Chodesh” – “Tomorrow is Rosh Chodesh.” This is rather puzzling. When Rosh Chodesh falls out on Shabbat itself, it makes sense that we would read a special Haftarah. But what does it matter what the next day is? We don’t have a “Machar” anything else – no “Machar Pesach” or “Machar Shavuot,” only “Machar Chodesh.” It must mean that the day before Rosh Chodesh has intrinsic meaning, one worth marking with its own prophetic message. The definition of Rosh Chodesh is the night that the sliver of the new moon appears in the sky. The night before, Machar Chodesh, is a night with no moon at all. It is completely dark. The Haftarah of Machar Chodesh describes the darkest time in the life of David HaMelech. Until this point, he had been the golden boy of the kingdom: he defeated Goliath, was married to the king’s daughter, the king’s son was his best friend, and the entire country was singing songs about him. Now, all of a sudden, for no reason that he can discern, the king has turned against him. He barely escaped arrest and execution – his wife Michal helped him sneak out the window and lied about him to the guards. Yet, as far as he knows, he has done nothing wrong, and none of it makes sense. Yonatan, Shaul HaMelech’s son, does not understand it, either. He is sure that his father loves David as much as he does, and that he would know if something were wrong. The Haftarah tells us about the plan that David and Yonatan devise to figure out how Shaul really feels about David, a plan that is carried out the next day – on Rosh Chodesh. And indeed, when Shaul hears that Yonatan let David be absent from the Rosh Chodesh celebrations, it is sufficient pretext to ignite his fury, and he lashes out not only at David, but at Yonatan himself. Now David has no choice but to run and hide from the king. This means that he loses everything – his family, who are also in danger and go into exile in Moav, his position in the king’s army, his role in the court, his wife Michal, and worst of all, his dearest friend, Yonatan. As we read about the two of them standing there crying on each other’s shoulders, we wish that we could tell David that his future will be a bright one, that he will become king over all of Yisrael, and that he will establish a dynasty that will be the aspiration and hope of all of the Jewish People for all generations. ונוהגין לומר: דוד מלך ישראל חי וקיים, שמלכותו נמשל ללבנה ועתיד להתחדש כמותה וכנסת ישראל תחזור להתדבק בבעלה שהוא הקדוש ברוך הוא, דוגמת הלבנה המתחדשת עם החמה שנאמר: שמש ומגן ה’ (תהילים פד, יב) ולכך עושין שמחות ורקודין בקידוש החדש דוגמת שמחת נשואין. It is customary to say: “David Melech Yisrael, lives on forever!” because his reign is compared to the moon, and is destined to be renewed like the moon, and Knesset Yisrael will return and reconnect with her spouse, which is HaKadosh-Baruch-Hu, just as the moon is renewed with the sun, as it says, “Hashem is the sun and the shield” (Tehillim 84:12); therefore, we dance and rejoice at the Kiddush HaChodesh as one does at a wedding. The Rema explains that the moon symbolizes David HaMelech. Just as the moon waxes and wanes and disappears but then waxes again, so, too David’s dynasty waxes and wanes. It might look like it has completely disappeared, but it will reappear. When we see the renewed moon, we are filled with the hope that we will also be privileged to see the renewal of David’s kingdom. The Rema takes this idea one step further: the moon is a metaphor not only for David, but for the Jewish People as a whole. We, too, wax and wane. We, too, sometimes feel like we’re in danger of disappearing entirely, and that G-d’s light no longer shines upon us. The renewal of the moon gives us hope and reminds us that our relationship with G-d is also renewed. Machar Chodesh, the darkest night of the month, symbolizes the Jewish People at our most vulnerable. The Haftarah of Machar Chodesh presents us David HaMelech at his most vulnerable, as he stands before a future that looks bleak and dark. His life, and the life of his descendants, will not move in a straight line. There will be highs that will reflect light and hope for millennia, and there will also be lows that last for generations on end. So, too, the Jewish People. Our story also does not follow a straight line. Yet, as the Haftarah of Machar Chodesh reminds us, no matter how bleak and dark a given moment in Jewish History might be, we know that the future we face is full of light. Parshat Shmini and the Haftarah of Shmini both contain stories of tragic deaths. Parshat Shmini describes how, just at the culmination of the dedication of the Mishkan, Nadav and Avihu lit a fire for the incense, and were killed by the Divine Fire that appeared. The Haftarah of Shmini describes how, while bringing the Ark of the Covenant to Yerushalayim, Uzah, one of the people leading the procession, reached out to keep the Ark from falling, and was struck down by G-d. What did they do that was so terrible that caused them to lose their lives? It does not say “the Cohanim with the Ark of Hashem crossed;” it says “the Ark of Hashem crossed.” The Ark made it possible for the Cohanim to cross the river, not the other way around. The Midrash points out that Uzah should have known that the Ark was not an ordinary object that follows the laws of nature; it did not need him to keep it from falling. Nadav and Avihu made a similar mistake for similar reasons. Everything had been laid out the final stage of the dedication of the Mishkan, and all that was missing for the fulfillment of its purpose of “I shall dwell among you” was the manifestation of the Presence of G-d. While waiting for it to appear, Moshe and Aharon left the Mishkan and went out to bless the nation. After their blessing, G-d’s Presence manifested itself, in two ways: the Cloud of Glory appeared on the Mishkan, and Divine Fire came down and consumed the offering. The verses then shift to Nadav and Avihu, who had remained inside the Mishkan, and were waiting for G-d’s Presence to appear. For whatever reason – perhaps impatience, perhaps arrogance, perhaps a misplaced sense of devotion – instead of continuing to wait like they were supposed to, they decided to take matters into their own hands, and make their own fire. But the Divine Fire did come down, without their help. It started at the internal incense Altar, where they were standing, and went out to the external Altar where the sacrifices had been laid out. Nadav and Avihu, who were not supposed to be there, were caught in its path. Nadav and Avihu must have thought that they were operating in the physical world, where fire is lit by human beings. But just as G-d did not need Uzah to keep the Ark from falling, He did not need Nadav and Avihu to make fire in the Mishkan. Disobeying the laws of the Torah regarding objects that do not quite obey the laws of physics can be hazardous to one’s health. It is from Yirmeyahu, and it is not good news. Kira on HaGadol – Who will write for us? Yael Shahar on HaGadol – Who will write for us?